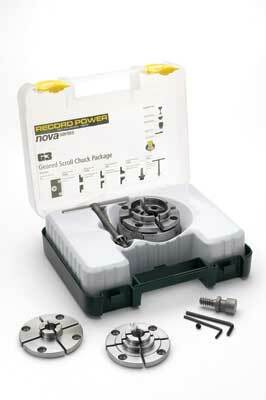 The Record Power Nova G3 scroll chuck package comprises a G3 Chuck body with 20mm (3/4in) x 16tpi thread, JS50N 50mm (2in) jaw set, JS25N 25mm (1in) jaw set, 6025 mini step jaw set and 10006 Woodworm screw, all in a plastic case. The package also comes complete with full instructions. The instructions tell you how to fit mount the jaws and the locking feature - effectively a stop to keep the jaws inside the body - this stop is factory fitted and also the contraction and expansion measurements for each jaw set. The best practice when fitting jaws is to have the jaw sets fitted loosely, close the chuck to the centre so the edges of the jaw section touch, and then tighten the screws, which eliminates any risk of inaccuracy in fitting. The chuck looks to be well made and robust so I set about using various jaws on some worm-eaten ash (Fraxinus excelsior) bowls. The key locates well in the body and it is easy to tighten and slacken off the jaws. There is a key, which locates via a hole in the body, but do not be tempted to slow work down using a hand on the chuck - you don't want to catch your hand on the jaws or in any of the holes. There is a lot of power in the chuck to hold things securely, but likewise on small or incorrectly formed spigots, you can crush the fixing point. The same goes when using softer timbers. This is just a question of people being more accurate and also knowing the timber they are working with. The woodscrew provides a secure hold, but it is worth pointing out that you have to choose the wood and the project carefully. The effective length is 23mm (29/32in) from tip to flange, but if mounted in the JS50N jaws as recommended, this reduces the effective length by 8mm (5/16in). It doesn't sound much, but in softer less dense woods, it could tear out. The hold in denser materials is excellent. All in all, the chuck performed well. The build quality is good, with no sharp edges or rough components. 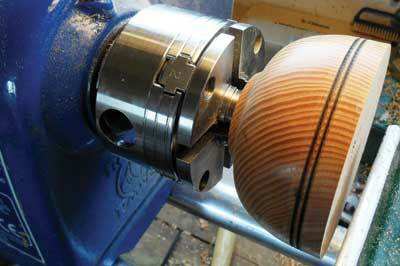 It would be an ideal package for someone starting out who has a mini/midi-sized lathe. I think this is a cracking mid-sized chuck package. It would suit any turner well, and because of the mix of jaws supplied with it, would particularly benefit those turners starting out. A lot of projects can quickly be tackled with this. The build quality of the chuck is also very good.